As the name will probably tell you, Dragon Emperor is themed around the Chinese and their love of these mythical creatures. Quite a few jade jewels are also among the symbols, another clue that tells you what the game’s theme is about. Aristocrat designed this game, and it’s one of a couple of titles with a theme inspired by dragons or by the Chinese. It seems to be a favorite of theirs, but luckily they also have other things to offer, besides the theme. Since Dragon Emperor uses the Reel Power, and because there are three symbols on each of the 5 reels, we can figure out that the number of ways to win goes up to 243. The game has free spins, scatter symbols and wilds as its additional features. Top payouts go up to 1,000x. 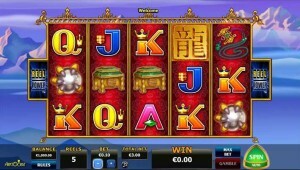 The game’s main features would include the Reel Power, the wild symbols, scatters and the free spins. The Reel Power feature is called ways to win in many other slot machines, this being a feature which is quite popular in newer titles. The game makes use of symbols which are on neighboring reels, going from the leftmost one to the right. The symbols can be in any position on those reels, they will still be part of a winning combo. A total of 243 ways to win are offered in this case. The payments for the wins are also different in Dragon Emperor, being based on the total stake, instead of using the line bet as a guide. Now, we’ll move on to the more regular features of this slot, starting with the wild symbol. Represented by the Golden Dragon, this wild is capable of replacing any other symbol, with the exception of the scattered Golden Squares. A feature called Reel Shuffle can be triggered when the wild appears on all three positions of the 5th reel, where all the other reels will spin once for free. The free spins are obtained alongside a prize, whenever the game has a minimum of three scattered symbols with Golden Squares. The payouts will go up to 40x the bet, plus you will get between 7 and 15 free spins (for three to five scatters). You will use a system where lines replace ways to win for betting purposes. The game has 30 lines for you to bet on, but it will use ways to win to create combinations. Each line gets one coin and you choose what its value will be, the minimum being $0.01. The game’s top rewards aren’t that impressive unfortunately, at only 1,000x the line bet, but it’s understandable when you take into account how many chances to win you get each round. 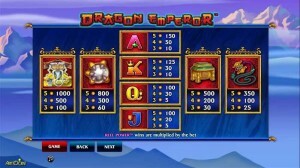 The design of Dragon Emperor is pretty typical for a slot machine that aims to look like it’s inspired by the Chinese. The background picture is a beautiful one, of mountain tops that are visible above the clouds. The reels look rich, with red velvet like backgrounds and with golden borders with decorations surrounding all of them. As for the symbols, they mix classic playing cards and Chinese themed objects, like jewelry made out of jade, dragon claws or treasure chests. Symbols: Golden Dragon (wild), Golden Square (scatter), Emperor (1,000x), Claws (800x), Treasure Chest (500x), Pendant (350x), Ace (150x), King (125x), Queen (100x) and Jack (100x). 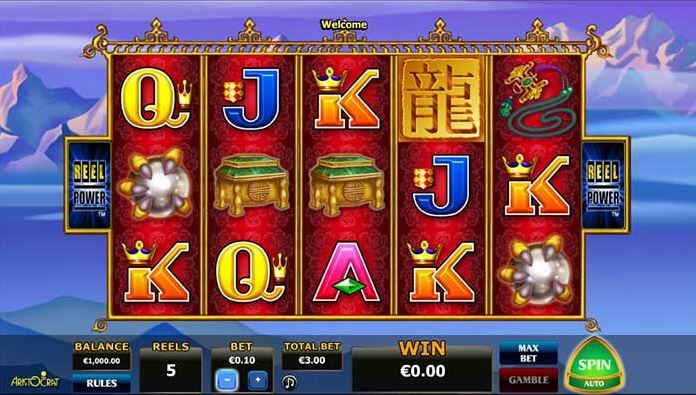 The Reel Power feature and the rest of the symbols and rewards that you get make this slot a good choice, as long as you’re looking for modern slot machines which give you lots of smaller payouts. You will find Dragon Emperor at any online casino which chooses to use software from Aristocrat, playable either for free or for real money.